On a Sea Scout ship, like in a Scouts BSA troop or Venturing crew, the young people — not the adults — are in charge. The same is true of Sea Scouting on a national level. Sea Scouts, the Boy Scouts of America’s program for all things on, in or under the water, is led by a young person known as the National Sea Scout Boatswain (pronounced “bosun”). 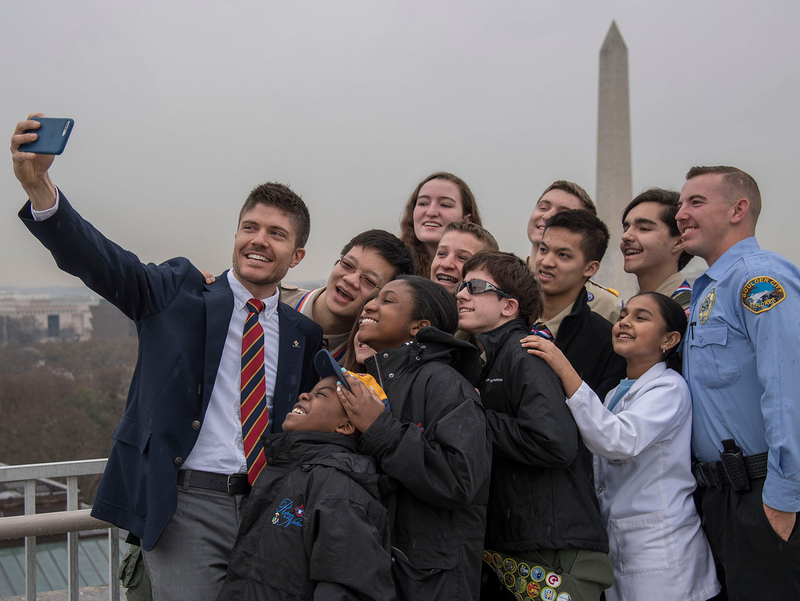 Under the mentorship of adult volunteers and professionals, the National Sea Scout Boatswain helps steer the program toward an exciting new future. This month, the National Sea Scout Support Committee selected Hannah Carter of San Clemente, Calf., as the 2019-2020 National Sea Scout Boatswain. Hannah, a member of Ship 936 of the Orange County Council, wants to recruit more young people into Sea Scouts, improve the relationship between youth and adults, increase social media engagement, and develop regular communications among youth. Her term will begin June 1, 2019, at which point she’ll take the helm from 2018-2019 National Sea Scout Boatswain Jack Otto. Hannah Carter (bottom row, middle) on the U.S. Coast Guard Barque Eagle. Sea Scouting is a program of the Boy Scouts of America for young men and women ages 14 to 21. Founded in 1912, Sea Scouting has promoted citizenship and improved young people’s boating skills through instruction and practice in water safety, boating skills, outdoor fun, social activities, service experiences, and knowledge of maritime heritage. Hannah Carter (right) at the 2018 Koch Cup in Galveston, Texas. Hannah is a member of “Mariners 636” in Dana Point, part of the Orange County Council. She serves as Western Region Boatswain and is an Able Sea Scout working on the Quartermaster Award, the highest rank in Sea Scouting. Hannah has cruised aboard the Barque Eagle, the U.S. Coast Guard’s most famous ship and the only active-duty sailing vessel in America’s military. She completed the weeklong Sea Scout Advanced Leadership training, known as SEAL. And she has twice competed in the biannual sailing competition known as the Koch Cup. Outside of Scouting, Hannah is a competitive dinghy sailor and instructor and is a member of her high school’s choir and Key Club.